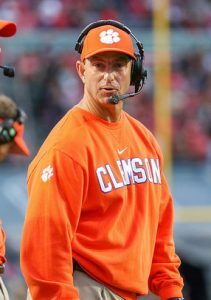 Although Dabo Swinney is well-known for being one of the country’s top college football coaches, he is also known for his compassion for people and his inspirational way of communicating with those around him. Some of his most notable quotes include: “The only disability in life is a bad attitude”, “Don’t let anyone walk through your mind with dirty feet”, and “I always told people growing up, Alabama was the smartest state: (it has) four A’s and a B”. Most Alabamians especially enjoy that last quote. You might think that “Dabo” is an unusual first name. Actually, Dabo wasn’t born with it, but instead, acquired it as a very young child. His given name is William Christopher Swinney. When he was born, his older brother repeatedly tried to enunciate the words “that boy”, but could not get the sounds out correctly. Eventually, the family started to call the new baby “Dabo”, in place of “that boy”. As you can presume, the name stuck throughout Dabo’s entire life, as he is still referred to as Dabo Swinney. Football has been a part of Dabo’s life for many, many years. From his early college days on the Crimson Tide’s team to his current station in life, as Clemson’s beloved head coach, Dabo has made a popular name for himself in the college football arena. He and his wife, Kathleen, have three teenage sons and live in a beautiful new home that is close to the Clemson University campus. When he has free time, he has commented that he mostly enjoys spending time with his family, playing golf, traveling, and engaging in other things that help him to relax. Dabo Swinney has many more promising years of football coaching ahead of him, and continuing to help guide young folks as they develop into well-rounded adults.